Hate Phone-calling? Me Too. But Let’s Not Let the DACA Dream Die. I hate calling politicians. I’d much rather go for a walk with them and rant and rave lecture them ask them what the hell they were thinking explain my point of view–and, of course, politely listen to theirs. And DACA being under threat makes my stomach turn heavy and cold. This is what last year’s election boded. Now it’s happening. Or it might. 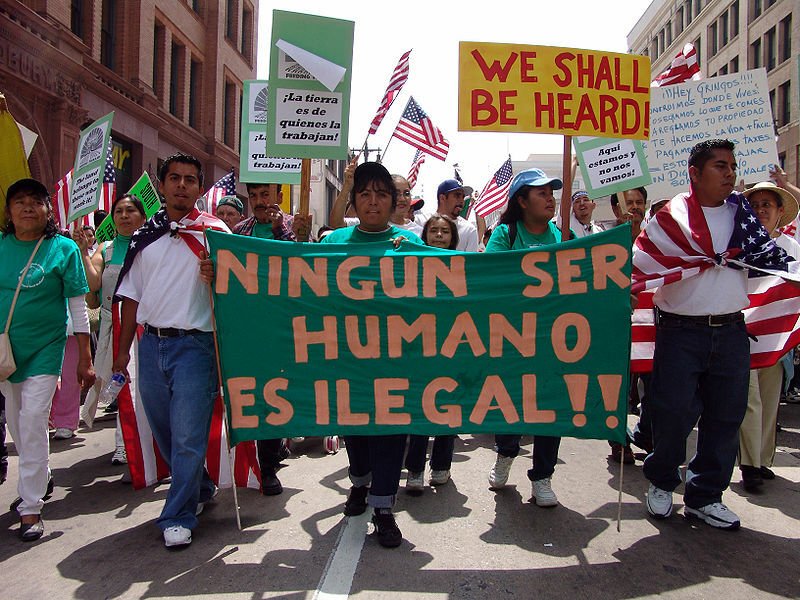 From the May 2006 Immigration rally in Los Angeles (courtesy Jonathan McIntosh, Wikimedia Commons): No Human Being is Illegal! Since attacking DACA on the campaign trail, President Trump has pledged to keep the program alive, calling recipients, also known as Dreamers, “absolutely incredible kids” who deserve compassion. But in recent days, key players in his administration have advised Mr. Trump to wind down the program, and his attorney general, Jeff Sessions, has informed him he considers it unconstitutional and cannot defend it in court, according to people familiar with the discussions who insisted on anonymity to describe private deliberations. While the White House has declined to comment on the fate of DACA, several officials and people briefed on the discussions now say the president is on the brink of ending it, although they note that Mr. Trump often changes his mind. Mr. Trump has been pondering — and publicly agonizing over — what to do about the program since he took office. But discussions about it inside the White House took on new urgency after a group of conservative state attorneys general threatened to sue the Trump administration in federal court unless it begins to dismantle the program by Sept. 5. And if you prefer to talk to (and thank) someone standing up for immigrants, Washington’s Attorney General Bob Ferguson is leading a coalition of 15 other attorneys general to support the Deferred Action for Parents of Americans (DAPA) against a separate legal challenge. Is your state’s AG on this list? Call Bob’s office to find out: (360) 753-6200. You know what? I still hate calling politicians. But I feel better knowing that maybe a few of you guys are now joining me. This entry was posted in Wing's Words and tagged Attorney General Bob Ferguson, DACA, DAPA, DayWithoutImmigrants, immigrant rights, ImmigrantsTheyGetTheJobDone, immigration, Make America Great Again by gretchenwing. Bookmark the permalink.